Ofcom have proposed C61, C62 (and C69) will be removed from Freeview and be moved to C39, C40 and C38. 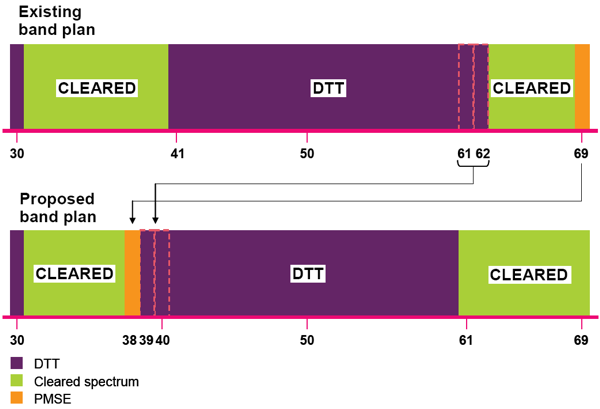 Ofcom have proposed to modify the frequencies involved in the Digital Dividend Review. For several reasons, this now means that C61, C62 and C69 will be removed from the digital terrestrial (Freeview) and PMSE allocations and moved to C39, C40 and C38. By having the same band (790-862 MHz) allocated across Europe, this will allow a larger market to use the frequencies which will lower consumer costs and provide interoperability for – whatever services get used. C38, currently used for radio astronomy will be used for programme making and special events (PMSE) after switchover is complete. PMSE are basically small radio links. Moving C61 and C62 to C39 and C40 would cause problems for some viewers, as these could change the aerial group for reception of channels. This would mean that many viewers would have to buy a new aerial. However, by a series of chess-like moves using other frequencies, it is possible to resolve this problem. Ofcom has presented a hybrid option, which is detailed below. This shuffles a few allocations around and provides a solution where there is no loss in the coverage of the three PSB multiplexes, and also provides all six multiplexes in new groups only where this has already happened. The new allocation on the main transmitters are shown below. It has not yet been decided if these changes will be implemented after switchover is complete, or as part of the current plan or if additional retuning may be required during the process. Abercynon PSB3 C61, Aberfoyle PSB3 C61, Aberystwyth PSB2 C61, Alderney PSB2 C61, Alexandra Palace PSB3 C61, Andoversford PSB3 C62, Armitage Bridge PSB3 C61, Assendon PSB3 C62, Balblair Wood PSB3 C62, Ballantrae PSB2 C61, BANGOR PSB1 C62, Barskeoch Hill PSB3 C62, Batley PSB3 C61, BEAMINSTER PSB1 C62, BEDDGELERT PSB1 C62, Beecroft Hill PSB3 C62, BEER PSB1 C62, Bexhill* PSB3 C61, Bincombe Hill PSB1 C62, Bishops Stortford PSB3 C62, BLUEBELL HILL COM6 C61, Bradford West PSB3 C62, BRECON PSB1 C61, Bridgnorth PSB3 C62, Broad Haven PSB1 C61, Burry Port PSB1 C61, Camlough PSB2 C61, Cane Hill PSB3 C61, Cannongate HP PSB3 C61, Cannongate VP PSB3 C61, Castlederg PSB3 C61, Castleton PSB3 C62, Caterham PSB3 C62, Catrine PSB3 C62, Chisbury PSB3 C62, Claonaig PSB3 C62, Clearwell PSB2 C62, Cleckheaton PSB3 C62, Clun PSB3 C62, Copley PSB3 C62, Cornholme PSB3 C61, Countisbury PSB2 C62, Cragg Vale PSB3 C61, Craigellachie PSB3 C61, Creetown PSB2 C62, CROESERW HP PSB1 C61, CROESERW VP PSB1 C61, Cullingworth PSB3 C62, Cumbernauld Village PSB3 C61, Dallington Park PSB3 C62, Dawlish PSB1 C62, Dolgellau PSB3 C62, Dollar PSB3 C61, DOWLAIS PSB1 C61, Dromore PSB2 C61, Dronfield PSB3 C62, Eardiston PSB3 C61, Earl Sterndale PSB3 C61, East Grinstead PSB3 C62, Ebbw Vale PSB3 C62, Ederny PSB3 C61, Edmonton PSB3 C61, Elland PSB3 C61, Ferndale PSB3 C62, Fernhill PSB2 C62, Fishguard PSB2 C61, Fodderty PSB3 C61, Gartley Moor PSB2 C61, Gellifendigaid PSB3 C62, Gib Heath PSB3 C62, Girvan PSB3 C62, GLASGOW WEST CENTRAL PSB1 C62, Glenariff PSB2 C61, Glenluce PSB3 C63, Glespin PSB3 C61, Glyn Ceiriog PSB2 C61, GLYNDYFRDWY PSB1 C62, Glynn PSB2 C61, GOSFORTH PSB1 C61, Gourdon PSB2 C62, Grandtully PSB2 C61, Grantown Link* PSB3 C62, Grasmere PSB2 C62, Gravelly Hill PSB3 C62, Great Missenden PSB3 C61, Haddington PSB3 C61, Hagg Wood PSB3 C62, Halesowen PSB3 C61, Haltwhistle PSB2 C62, Hammersmith PSB3 C62, Hastings Old Town PSB3 C62, Hatch Bottom PSB3 C61, Headingley PSB3 C61, Helston PSB2 C61, Henley PSB3 C61, Hertford PSB3 C61, High Wycombe PSB3 C62, Hollington Park PSB3 C62, Holmfield PSB3 C62, Holmfirth PSB3 C61, Horndean PSB3 C62, Hutton PSB2 C62, Ilfracombe PSB2 C61, INNERLEITHEN PSB1 C61, Inverness PSB3 C62, Ireshopeburn PSB3 C62, Ironbridge PSB3 C61, Kidderminster PSB3 C61, Killearn PSB3 C62, Kilmelford PSB3 C62, Kilve PSB2 C62, Kingskerswell PSB1 C62, Kinlochleven PSB3 C62, Kinross PSB2 C61, Kirkconnel PSB3 C61, Lamberhurst PSB3 C62, Lambourn PSB3 C61, Lea Bridge PSB3 C62, Leadhills PSB3 C61, Leamington Spa PSB3 C62, Lisbellaw PSB3 C61, Liverton PSB1 C62, LLANDDERFEL PSB1 C62, Llandecwyn PSB1 C61, LLANENGAN PSB1 C61, Llangeinor PSB3 C62, Llangollen PSB2 C61, LLANGYNOG PSB1 C62, Loch Feochan PSB2 C61, Lochearnhead PSB2 C61, Longwood Edge PSB3 C62, Luccombe PSB3 C62, Lulworth PSB3 C62, Luton PSB3 C62, MACHEN UPPER PSB1 C62, Marlow Bottom PSB3 C61, Mickleham PSB3 C61, MIDHURST PSB3 C61, Millhouse Green PSB3 C61, Millport PSB3 C61, Modbury PSB1 C62, Monmouth PSB3 C62, MYNYDD BACH PSB1 C61, Mynydd Pencarreg PSB1 C61, New Addington PSB3 C61, New Barnet PSB3 C62, Newbattle PSB3 C62, Newcastle PSB2 C62, Newton Ferrers PSB1 C62, Newtownards PSB2 C61, North Hessary Tor PSB1 C62, Onich PSB3 C61, Orpington PSB3 C62, Oughtibridge PSB3 C62, Pembroke Dock PSB1 C61, Penicuik PSB3 C61, Pennsylvania PSB2 C61, Penrhyn Coch PSB1 C62, Penryn PSB1 C62, Peterhead PSB2 C62, PONTARDAWE PSB1 C61, Port Isaac PSB1 C62, Portishead PSB2 C62, Portpatrick PSB2 C61, Praa Sands PSB1 C62, PRESTON PSB1 C61, Ravenscar PSB3 C61, Rheola PSB3 C62, Ripponden PSB3 C61, Ross on Wye PSB3 C62, Rothbury PSB3 C62, Rothesay Town PSB3 C62, Scalloway PSB2 C62, Scoval HP PSB2 C62, Scoval VP PSB2 C62, Shatton Edge PSB3 C61, South Maesteg PSB3 C62, SOUTHWAY PSB1 C62, ST AUSTELL PSB1 C62, ST BEES PSB1 C61, St Brelades Bay PSB2 C62, St Helier PSB2 C62, Stanton Moor PSB3 C62, Steyning PSB3 C62, Stocksbridge PSB3 C61, Sutton HP PSB3 C62, Sutton VP PSB3 C62, Swinster PSB2 C62, Taffs Well PSB3 C62, Ton Pentre PSB1 C61, Tonypandy PSB3 C62, Tonyrefail PSB3 C62, Tregaron PSB2 C62, Troon PSB3 C61, Truro PSB2 C61, Tullich PSB2 C62, Turves Green PSB3 C62, Tynewydd PSB2 C62, Uplawmoor PSB3 C61, Washford PSB2 C62, Weaverthorpe PSB3 C62, Weisdale PSB2 C61, Wheatley PSB3 C61, Whitby PSB3 C62, Winchcombe PSB3 C61, Wincobank PSB3 C62, Wivenhoe Park PSB3 C61, Woodbridge PSB3 C61, Woodcombe PSB2 C62, WORKINGTON PSB1 C61, Ynys Owen PSB3 C62. Briantist: It would appear that some, but not all affected relays of Emley Moor have aleady had frequency allocations adjusted to take account of the inclusion of C61/C62 in the digital dividend for 4G. I note from Digital UK info that Idle now uses C39 for ArqB, Headingley has C49 for BBCA, and Wincobank and Beecroft Hill both use C50 for BBCB. With regard to Waltham it is odd that Birchover and Kings Lynn have been allocated C49 which would have been the expected sustitute for C61. Likewise Skipton (which relays Keighley) is using C49 which I would have expected to be used at Keighley, which is still on C61, probably due to overlap with relays of Winter Hill. The situation at Tacolneston is even more interesting with both C62 and C50 allocated at DSO. Several reports predict that 4G will reduce Freeview to 20 basic channels. If that turns out to be so, what will the channels be? Would you please warn people off these 7" and 9" screen 12 volt (DC) portable digital receivers with 5.75" mag mount aerials or more likely pull-out wire 'twigs' of similar length - they are often sold on *bay . The sets are usually well build (by today's standards) but have no external aerial socket (coax Belling-Lee type)-though I have heard that one manufacturer uses a mini-jack socket for aerial in! - unless you live about 5 miles or nearer to transmitter you simply cant use these devices , the same goes for the PC operational MobiDTV Pro - works spot on with a proper roof aerial but the 5.75" supplied is no use . Though to be fair MobiDTV Pro do fit a proper aerial socket. Regrettably this is one serious loss with digital, the now you have it now you don't signal, whereas Analogue was far more use with portable TVs even in only average reception areas. Two steps forward - three steps back! Watlingfen: The current digital TV service is designed to be used for static reception from a rooftop aerial. The old overpowered analogue services were indeed suitable for indoor reception ... and caused massive problems when there was Inversion.